Oh My! Where did Summer go?!? Even nature seems to be wrapping up here in the high desert of New Mexico as the temperatures have plummeted to the mid 60’s at night. Our Monsoon season came early this year (July instead of August) so we may end up with a wonderful “Indian Summer” this Fall. 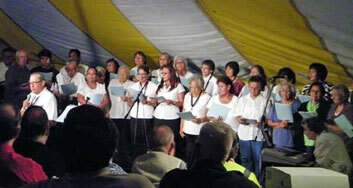 Western Indian Ministries celebrated its 75th anniversary and Bible conference (July 25-27). It was a busy time and a wonderful time of remembering the past, rejoicing in the present, and peeking at the future of what God might be doing through this mission. We had a few less people than anticipated, but still quite a good crowd – the rains washed out the outdoor fun day though. What we heard from the people that were involved with the mission from many years ago was a great testimony to God’s faithfulness and blessing and gave a better understanding into why He is not done with ministry in this area yet! Radio is in the planning stages for our annual Sharathon (October 3-5th). Please pray that we would make the time to get all our ducks in a row and that God would be glorified through it. The bookstore continues to take up a lot of Scott’s time, please pray that He can get back to engineering soon. Thanks for remembering the ministry and family in your daily prayers.